Try to find the perfect finishing touch to your army costume? Well, a good soldier always carries a good weapon, so we think we have exactly what you need to complete your jarhead transformation for Halloween. 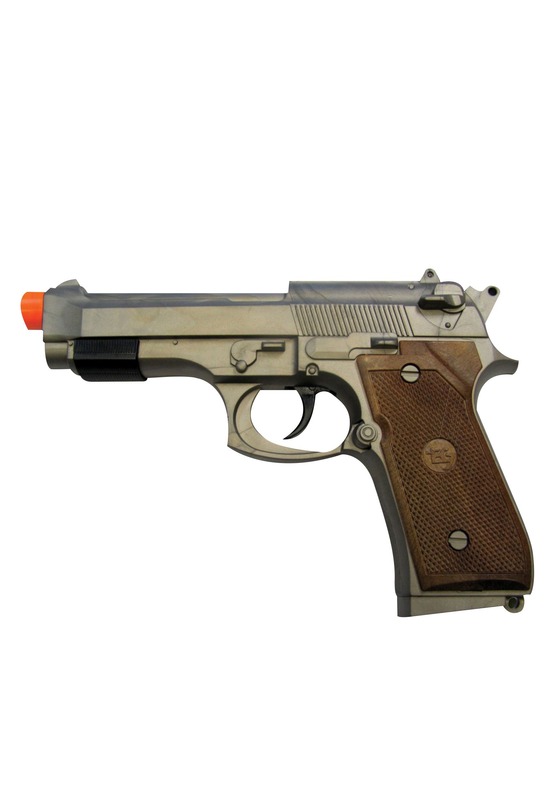 Take a look at this awesome Desert Storm TOY Pistol! Add this amazing accessory to your deluxe army costume and you’ll look like the real deal. Well, assuming you have some kind of uniform. We have a costume for that, just in case you were wondering! Once you have the whole ensemble you can have tons of fun in the party scene, bravely making sure that freedom is being enjoyed everywhere. Should you be interested, this does fire caps, but they aren't included. Also, there's an orange tip for safety. That's a must. You shouldn't go waving this thing around to the unsuspecting. Always use anything firearm-shaped responsibly! Now that you've found the perfect toy gun, what's next? You've got to find the right costume! We have a lot of Army costume options so check them all out. Continue to accessorize with more toy weapons, belts, boots, and more. Maybe you'll be inspired to truly join the military and defend your country! But for now, just enjoying the party is good. Enjoy it responsibly, and enjoy it with this realistic accessory.